Being that this is Valentine’s week I thought I would share some of the reasons why I love golf. Why I enjoy being around the game so much that I made it my career. Someone once said about baseball that the real action happens between pitches, my interpretation is that they were speaking about the interaction of the spectators. Golf is virtually the same you can spend hours with someone in a relaxed environment, you can learn more about a person in a round of golf than years spent in casual dinners and days in the office. There is a high amount of time between shots where you can learn about your playing companions. The game will bring out your true character, and you will see how you and other people act and react to challenging situations. Though out the years it amazes me how wide of age variances have been of the golfing groups that I have enjoyed playing in. When I was in my twenties I routinely played with people in their seventies. I was given advice and taught lessons that I apply in my life today. I’m hard pressed to think of an activity where everyone can play together regardless of age, strength, natural ability. When I retire I want to play daily! You can play with people that have different abilities and still come-up with a fair game. Even if they do not want to participate competitively, you are always competing against the course and yourself. There is nothing better than getting outside and getting some physical and mental stimulation. The game cannot be mastered, even when you are playing well, in your mind you could always shave strokes off of your score. Hitting a great drive only to hit the worst approach shot of the day. It is amazing how I routinely walk off a green shaking my head at what just happened, you have to be kidding! All I want to do is play the hole again, I know I can improve. The PGA Tour gives more to charity in a year, than the other 4 major sports combined. Once you start adding up all the charity golf outings it is amazing how golf supports people in need and worthy causes. If this is the year you want to raise money for a charity near and dear to your heart, contact us we will help you exceed your dreams of a great event. Oh what a feeling, I’ve found the secret, God please let me be able to repeat it! It may be the only good shot I hit all day but I know I have it in me. Can I clear the water hazard 250 yards away? Heck yes, my reasoning I have done it before, I have it in me. Even if you play the same course everyday it is never the same: course conditions change, the wind is different, the hole location is moved, and the hole length can be altered depending on weather factors. It is never the same, and unfortunately neither is my swing. There is something exciting about watching golf on T.V. especially if you have played the venue in the past. I would sign-up for softball if we could play at Wrigley Field, what a great place to hang-out after the game. Try not to smile when you make a long putt, hit it close or bomb it down the fairway, It is nearly impossible! I encourage each and every one of you to find your own reason to love the game. If you are like me and are already in love with the game, Purgatory Golf Club offers annual memberships to the course and range, call the golf shop at 317.776.4653 ext. 1 for information or email me at brhodes@purgatorygc.com. Don’t forward this to my wife – this is a longer love letter than I have sent her in 19 years of marriage. Colliers International, out of Columbus, Ohio, held their golf outing at Purgatory Golf Club on Tuesday, Ocotober 8th. Amanda Abraham, an employee of Colliers International, is the sister of Purgatory’s owner, Mike Merchent. Look below for video from the outing, and check back later for some photos! Western Waterproofing held their 2013 golf outing at Purgatory Golf Club yesterday, October 3rd. The outing included lunch for the participants, an 18 hole scramble, a closest to the pin competition, and several raffle prizes. Look below for photos from the outing! Amerisure – Indiana Manufacturer’s Association held their annual golf outing benefiting the Make A Wish Foundation at Purgatory Golf Club on Monday, September 16. The outing was an 18 hole scramble, with a closest to the pin and a longest drive competition. Following the scramble, a silent auction was held in the dining hall during the dinner hours. A child that had been granted a wish from the Make A Wish Foundation also shared her story. July 18th is our British Open Men’s Night. Open to All! It’s our popular Fish and Chips event with a back nine shotgun start at 6 pm. Play great signature holes like Eternal Torment, Blinding Cloud of Smoke and Hell’s Half Acre. The entry fee of $35 covers free range balls, nine holes of golf with a cart and a complimentary buffet.. In addition, join Assistant pro Brian Pearce (purple shirt) for the special events before play. Brian hosts a chipping contest at the range to win a free draft back at the clubhouse. Noblesville’s Carmacks Cigars brings their popular cigar buffet to the range along with a Demo Day by Cobra Golf from 2:30-6 pm. A courtesy pass to fish the putting green pond is also extended to players from 4 to 9 pm. Back at the clubhouse, Chef Tom’s famous fish and chips buffet closes the event. Call the pro shop, 776-4653, by Wednesday, July 17 to reserve a tee slot. chance to a free round of golf with a US Open golf pool. Call the Pro shop at 776-4653 no later than noon, Wednesday, June 12 to reserve a tee slot. Three Putt Contest Precedes, 6 pm Shotgun Start! Purgatory’s May Men’s night event is scheduled for Thursday, May 9, the first day of the Tour Players Championship (TPC). The monthly nine hole event is open to all and play begins with a shotgun start at 6 pm. Players return to the clubhouse for complimentary buffet and beverage specials. The men’s night entry fee of $35 includes nine holes with GPS enhanced golf cart, free range balls, beverage specials, complimentary food, door prizes and a chance to a free round of golf with a TPC golf pool. Golfers play with their own group and select their own tees and game. Twosomes and singles can be paired. 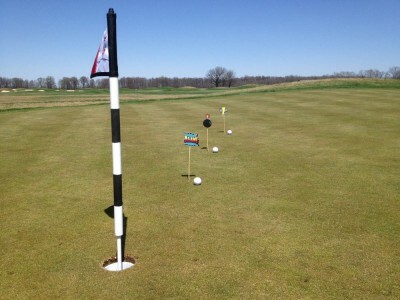 The event also includes a Three Putt Contest from 5:00 to 5:45 pm. Golfers enter as a 3-person team and must simultaneously sink putts from 3, 6 and 9 feet. If making all three putts, players win a free draft after play. Call the Pro shop at 776-4653 no later than noon, Wednesday, May 8 to reserve a tee slot. What a fabulous evening! The amazing group of women that come out for our ladies night, well there just aren’t enough adjectives to describe them but I’ll try. They are witty, fun, bright, stylish, athletic, and on time (that’s a jab at the guys :D) to name just a few. The guys forgot to turn off the sprinklers, which were aimed right at us as we were waiting to go off. So more than a few of us got wet. Luckily it helped us stay cool. Here are some of my very favorite group & action shots from the evening. Congratulations to all & thank you also to Michael Beckert for bringing his Nike trunk show to the club so we could all place orders for our must have golf clothes! 108 Holes, 42,187 yards, One Ball! Noblesville…Too hot to play 18 holes of golf? 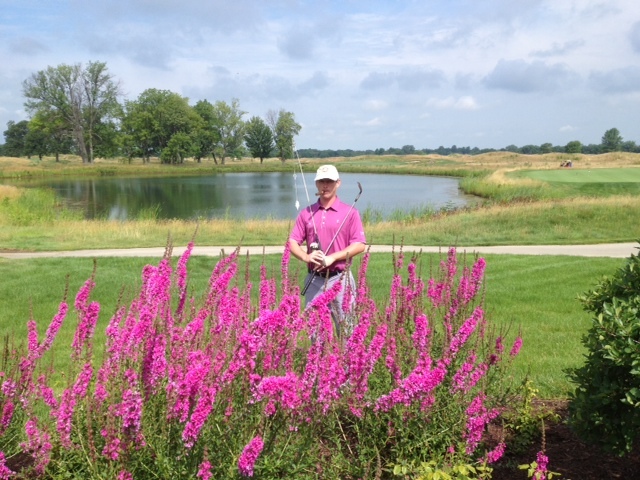 Not for Purgatory GC’s head professional Jon Stutz who played 108 holes and 42,187 yards Thursday at Noblesville’s Purgatory GC in a fund raising effort for the Indiana Golf Foundation and Autistic Awareness. Stutz started the day at 7 am and played straight through ending after 9 pm despite eight hours of his 14 hour round with temperatures in the 90’s. “You’d think I could have chosen a better day,” said Stutz. His father Jim Stutz drove the cart, offered support, putting advice and 20 bottles of water along the way. Playing the variety of tees at Purgatory, Stutz averaged under 73 strokes and played just one ball for the day. “Both of us were mighty wore out at the end of the day,” joked Stutz, having raised over a $1,000 for the two charities. Recruit good board members, because they are pivotal to your success. For instance, each member should be responsible for recruiting for people who will bring a foursome to the outing. Start everything on time, golf, lunch, dinner, entertainment, don’t give people a reason to leave. Keep games, mulligans and such to a minimum, they slow play, and reduce the likelihood that players will stay for dinner. Check out Brian’s website at http://www.tp-in.com/ thank you Brian for spending some time with us and sharing your valuable experience and insights!